Darth Umbravon, as he was now called, walked with his friends and fellow Sith Acolytes Shorya, Tormax, and Fernin. Though his body was still sore, and had multiple lightsaber wounds scored on it, Umbravon felt more powerful with the Dark Side of the Force than he had before. He wasn’t entirely sure what it was. He wasn’t sure if the confidence he had found through his victory allowed him to attain greater power, or if he discovered a greater depth of power within himself when he overpowered Gingus, or if his power was somehow deepened by a greater commitment to the Dark Side. One thing was certain though, his victory had indeed broken a chain, and he was more powerful now than he had been before his fight with Gingus. Umbravon and Tormax watched in silence as Fernin and Shorya disappeared into the distance, and then Tormax turned to him. “Follow me,” he said. Umbravon followed Tormax behind a random building on Korriban, and Tormax turned to him and pulled something out of one of his pockets. “Is that blaze blossom? !” Umbravon asked astonished, staring at the bag of red powder. “You aren’t very safe anyways,” Umbravon heard a voice speak out from a distance. Suddenly, Umbravon felt a sharp pain in his shoulder, causing him to fall to his knees and cry out in pain. Looking down, Umbravon saw the handle of a shikkar protruding from his left shoulder. Before he could do anything, the handle inexplicably snapped off, leaving the glass blade embedded in his shoulder. Umbravon looked up just in time to see three figures step out from around the corner of the building. There was a Keshiri, a Wookiee, and a Human with fiery orange hair and bone white skin. Gingus, Harvul, and Yavanok! Umbravon realized in alarm. Suddenly, Ignus pocketed his centriblaze, and he and Umbravon drew their crimson bladed lightsabers at the same time, bathing the area in a red glow. A little less urgently, the three other Acolytes activated their own lightsabers, a red one for Yavanok and Harvul, and twin orange ones for Ignus. The three Acolytes began to approach them. Darth Umbravon’s shoulder felt like it was on fire, he still had a horrible wound along his back, and a hole burned through his right foot. He sighed with relief when he saw the almost, but not entirely, concealed awkwardness in Gingus’s movements, realizing that he was also injured from their fight. His two allies however were in perfect shape, and Umbravon and Ignus were a little bit high from the blaze blossom. Feeling the pain of his various injuries and the mind altering effects of the blaze blossom, Umbravon knew he wasn’t going to last very long in a confrontation. He decided that the best way to survive this fight was to end it quickly. He and Ignus charged forwards at the same time, at their three enemies. Umbravon thrust out his left hand and hurled Yavanok several meters away with the Force before unleashing a series of fury driven strikes upon Gingus. To his right, he saw Ignus engaging Harvul, meeting his Djem So assault with a furious demonstration of Ataru. Umbravon drove Gingus back a few more feet under the rage of his assault. Suddenly, Umbravon leapt back a step and threw both hands in front of his body, hurling Gingus through the air with the power of the Force. Right after he did that, Umbravon threw his head back, seeing a glass shikkar fly mere centimeters away from his face in a blur. As soon as Umbravon returned to a normal stance, he raced towards where Ignus and Harvul were dueling, with Ignus holding a slight edge over his opponent. Suddenly, Ignus’s body flew through the air and slammed into a wall, and Umbravon turned his head to see Gingus back on his feet with both arms extended in front of his body. Suddenly, Harvul turned towards Umbravon and flew at him in a rage filled charge, unleashing a series of vicious and powerful overhand chops. Umbravon deflected his strikes to the side and started to fight back with his own furious display of Djem So. Gingus again thrust both arms in front of him, and with Umbravon’s focus split between making sure Ignus was alright and driving back Harvul, he was unable to prevent his body from flying through the air and slamming against the wall of the building behind him. Umbravon turned to see Ignus back on his feet, driving Yavanok into a desperate retreat. The Keshiri was almost running from him. Again, Harvul charged towards Umbravon and brought his blade down hard. Umbravon blocked his blade, keeping it a safe distance from his own body, but then felt an excruciating pain along the bottom of his abdomen. Staring down, he saw curved claws extending from the tips of each of Harvul’s fingers stabbing into his stomach. Umbravon desperately pressed as hard as he could forward on his blade, forcing Harvul to take a step back and draw back his arm. Immediately afterwards however, Harvul thrusted his hand out again, this time stabbing his claws into Umbravon’s left shoulder, tearing his wound apart even further. Umbravon cried out in agony and rage before snapping his head forward, striking Harvul in the face as hard as he could with the top of his head before slugging him in the stomach with his left hand. As Harvul fell back, Umbravon stomp kicked him in the chest as hard as he could, sending the wookiee sliding across the ground. It was then that Gingus charged at Umbravon, leaping over the still sliding body of Harvul, and landing on his feet to unleash a quick flurry of furious strikes. While Gingus was still injured from their earlier fight, Umbravon was now in much worse condition, so he was forced to back up into the wall. Just as one of Gingus’s strikes came within a couple of inches of carving through Umbravon’s skull, Umbravon extended his left hand and hit Gingus square in the chest with a blast of Force energy, sending his body hurtling through the air. Just as Harvul was rising to his feet again, Umbravon saw a hand close around the Wookiee’s weapon arm. Umbravon watched as Harvul spun around to stab his claws into the armored figure behind him, only to have his other hand slapped to the side. The armored figure thrusted his free hand into Harvul’s chest and released his arm, sending the wookiee flying. Umbravon, Ignus, Gingus, and Yavanok all watched in awe as the Wookiee slammed into the wall, sending a shower of bricks and dust everywhere. Umbravon felt his life wink out of existence through the Force. He turned his attention back to the armored man, recognizing him to be a member of the Dark Lord’s Guard. As the guard escorted their two remaining attackers away, Umbravon limped over to Ignus and the two Sith walked off towards the cantina, taking a few hits out of Ignus’s centriblaze as they did so. When they entered the cantina, Umbravon saw Shorya and Fernin sitting at a booth on the side of the cantina. Umbravon smiled as he slid into the seat next to her, while Ignus sat down next to Fernin. “I think my Sith name’s gonna be Nighthawk!” Fernin exclaimed with a smug grin on his face. “Better than karking Ignus!” Nighthawk shot back. “Let me see if I can get the shikkar blade out?” Shorya offered. “Sure,” Umbravon replied, smiling at her as he looked into her eyes. He may have been more powerful than Shorya in the Force, but with his mind clouded by pain and blaze blossom, he knew his application of the Force wouldn’t be as precise as hers, in fact she was normally more precise than him anyways. Shorya extended a hand delicately, and Umbravon began to feel the glass blade of the shikkar stirring beneath his flesh. The entire left side of his body lit up in pain as Shorya closed her eyes and began to draw the blade out of his body through the Force. Umbravon also felt something else. He felt Shorya place her other hand on his right shoulder reassuringly as the blade slid out of his wound. Umbravon clenched his teeth together as the glass sliced through his flesh one last time before being completely separated from the torn up mass of flesh that was his shoulder. He watched with astonishment as Shorya let the glass blade drop in the center of the table, stained black with a layer of Umbravon’s blood. Darth Umbravon stood up, walked over to the bar at the front of the cantina, and took a seat in one of the bar stools. A blue skinned humanoid with completely red eyes approached him. He was a Chiss, Umbravon realized, no more than a year older than him. “That wound doesn’t look too good,” the Chiss observed. “I’ve survived worse,” Umbravon retorted, hoping the Chiss would not press things further. The chiss reached into a pocket and withdrew a small golden orb before setting it down on the table. “What’s that?” Umbravon asked. “Go on,” Umbravon said, intrigued and worried at the same time. Darth Umbravon stared into the pinkish red fluid in the shot glass as he pondered the Chiss’s offer. If he accepted the Chiss’s offer, he would be able to heal all of his injuries before this mysterious Twi’lek attacked him, and he would gain a new ally with skill in alchemy. On the other hand, if Umbravon did not accept the offer, he might die here and now. The choice was a fairly simple one for him. “Deal!” Umbravon replied as he grabbed the shot glass, and tossed its contents into his mouth. Almost immediately, Umbravon doubled over in pain as the Orbfire spread throughout his system. His blood felt like it was boiling within his veins, his heart burned with intense heat, and his very skull felt like it was on fire, a raging inferno coursing within his very body. Every inch of his body was in excruciating searing hot pain, but when Umbravon glanced at his left shoulder, he was amazed to find the wound closing on itself, his very flesh and bone mending itself back together before his very eyes. As the pain died down, Umbravon leaned forward, clutching his forehead and panting. When the pain had departed completely, Umbravon felt very clear headed and as he ran his hands along the parts of his body that should’ve been injured, he was amazed to discover that not a trace of his injuries even remained, aside from his torn up clothing and blood. Suddenly, Umbravon’s face slammed into the bar with such force that it bounced off of it, before his barstool flew out from underneath him, causing him to collapse to the floor, clutching at his head. As Darth Umbravon pulled himself off of the ground, he heard mocking female laughter as he lifted his head to see a red skinned Twi’lek scantily clad in black clothing, looking to be around eighteen. She was smirking at him maliciously, hatred and malice apparent in her yellow eyes. A strange metalic cord was wrapped around her waist, seemingly as a belt. “You’re no Darth,” she said as Umbravon rose to his feet. “So you’re attacking me because you’re jealous?” Umbravon asked, confused, amused, and frightened at the same time. Umbravon tensed up and called forth on his passion, blocking out his fear with a wall of anger and hatred. “Prepare to die, obviously!” Riva cried out as she threw her body into the air. She extended her leg and twirled through the air in a blur, catching Umbravon in the chin with her heel before he could move out of the way. Umbravon staggered back as she jumped into the air again and kicked him in the chest with both legs, sending his body toppling backwards into the counter of the bar behind him. Bracing his back against the bar, Umbravon prepared himself for Riva’s next kick. When Riva lashed out with her leg again, Umbravon caught it in his hands and threw it into the air with all of his might before her other leg could strike him. His unexpected maneuver sent Riva spinning upwards through the air, but she twirled her body with the momentum, flying several meters into the air before falling back to the ground, and landing gracefully ten meters away from him. By now everyone in the cantina was standing back near the walls, the tables moved to the side to create space for the two combatants. “If I can’t have the mantle of Darth, then you can’t either!” Riva cried out as she pulled at something along her waist. Suddenly, the metalic cord unwrapped itself from around her waist, and flew into the air, spinning and twirling from a handle held in Riva’s right hand. Umbravon saw her press a button on the handle, and suddenly the cord was completely enveloped in a blazing light. The cord itself was now completely enveloped in white, while the area around it glowed scarlet. It crackled and hissed as Riva twirled it in circles with one hand to the right side of her body. A lightwhip! Umbravon realized as he pulled his own lightsaber from his belt, listening to the reassuring snap-hiss as it ignited in his hands. He had never come across a lightwhip wielder before, but thankfully he had some experience against whips from his time as an Innamortan soldier. Given that he had never faced an opponent such as this however, he figured he’d be better off starting the fight defensively. Riva continued to twirl the whip in circular patterns at her side, glaring at Umbravon as she did so. Then, she threw her arm forward, sending the tip of the energy blade shooting towards Umbravon’s head. Umbravon threw his body to the right and slapped the whip’s blade away with his lightsaber. Riva snapped the whip’s blade back towards her, drawing it back to her side as she continued to twirl it in more circular patterns at her side. The crackle and hum of the whip as it twirled through the air put Umbravon on edge. After a few more seconds of twirling the blade at her side, Riva swung her arm in a circle above her head and lashed out with it, sending the energy blade of the whip sizzling through the air towards Umbravon again, this time in an arc at his legs. Umbravon jumped up as the blade split the air beneath his feet, before the whip snapped up towards him. Desperately, Umbravon flung his arms to the side maneuvering his body’s momentum so he’d spin just out of the way of the whip. He fell to the floor awkwardly as Riva’s mocking laughter filled the cantina. That was all Umbravon heard; Riva’s mocking laughter, and the crackle and sizzle of her lightwhip as it split the air. Riva once again snapped her whip back towards her, this time twirling it in circular patterns around her entire body before bringing her arm up and down in front of her in a really sudden motion. The blade of her lightwhip shot forward and snapped down at the top of Umbravon’s head. Umbravon twirled to the side in response, watching as the blade of Riva’s lightwhip cracked down a foot to the side of him, unleashing a shower of sparks as it struck the ground. Riva then snapped her whip upwards at Umbravon’s blade. Umbravon, still finishing his twirl, watched fearfully as the whip’s blade wrapped itself around his own. Then, Riva snapped the blade forward. His body not firmly grounded and his blade held in one hand, Umbravon knew he did not have the leverage to resist Riva’s next move, so he moved with it. When Riva yanked her blade back towards herself, Umbravon rolled forwards towards Riva, somersaulting twice before wrapping his other hand around the hilt of his lightsaber. Swiftly, Umbravon yanked both of his arms back, pulling his weapon free from Riva’s whip. Though Umbravon could tell Riva did not expect him to maintain a grip on his weapon, she did something that sent a chill running down Umbravon’s spine. She smiled. It was then that Umbravon realized the truth of the situation. He was no longer dancing along edge of her weapon’s range, he was now about three meters closer to her, and that much further into her whip’s range. Umbravon realized he could not fight her as he fought most opponents. He could not dominate Riva with his strength or unleash a sequence of attacks to quick for her to deflect in time. Her choice of weapon made any power blows he attempted cumbersome and energy consuming. With that in mind, Umbravon knew what he would have to do when she attacked him. Riva resumed twirling her lightwhip in circular patterns around her body, but this time the speed of her whip’s blade increased drastically as she snarled with fury. Then she stepped towards Umbravon, lashing out with her whip several times in an erratic pattern as she continued to twirl the length of it around her body, its end whipping and snapping at various parts of Umbravon’s body or sweeping towards him in large vicious arcs. Calling upon his anger and hatred, Umbravon fueled his mind and body, using the Force to increase his speed and agility as he warded off Riva’s blows. He fought back against the crackling of her whip with a modified application of Soresu, in which he utilized a conjunction of tight movements to ward off some blows, and larger sweeping defensive motions to ward off others. Sometimes, Umbravon would be forced into a series of Juyo strikes, fighting back against the erratic path of her whip with his own erratic and furious blade work, lashing out at various points along the whip to alter its trajectory in a way that would prevent it from striking him, and occasionally in a way that allowed him to gain ground. It seemed peculiar because it was like he was attacking Riva’s weapon instead of Riva herself. Occasionally, Umbravon would be forced to utilize a Djem So or Shii-Cho strike, sweeping his blade along the length of her whip in a way that redirected it away from his body. From the first few seconds of their exchange, it became quickly apparent to Umbravon that Riva was far more skilled and powerful than Gingus. He could see why almost all of the other Acolytes feared her. Hell, Umbravon would be surprised if some of the Lords didn’t fear her. Had he fought her at the beginning of the day, Dylan would’ve been instantly eviscerated by her crackling whip. But he was no longer Dylan, he was Darth Umbravon, the Shadow of the Sith, and he would not be felled so easily. Umbravon had combatted whips several times before, given that he frequently sparred with the officers of his squad back on Innamorta. Foyle, one of the tactical advisors of the squad, made use of a bladed whip as her primary melee weapon in combat, and as Dylan he had learned how to counter its moves. Riva’s application of the whip was far more lethal, complex, and skillful than Foyle’s usage of it however. Aside from the Force enhancing both her physical and mental capabilities, as well as years of Sith training, Riva also manipulated the blade of her lightwhip with telekinesis. She was using the Force to alter the whip’s momentum, path, and trajectory, transforming it into a far more lethal weapon than it would’ve been otherwise. In this way, it almost seemed like the lightwhip itself was alive and conscious, in a way, making Umbravon attacking it with his own blade work seem more sensical. Darth Umbravon leapt over the whip of Riva’s blade as it sliced through the air towards him in a wide, but lightning fast sweep. He landed back on the ground just in time to deflect an erratic sequence of quick strikes and cracks from her lightwhip aimed at his face. He then stepped to the side as her lightwhip slapped the ground next to him. Leaving it on the ground, Riva swung her whip around, leaving a shower of sparks in its wake as it scraped the floor in a quick circular pattern, forcing Umbravon to once again leap over it as it came back around. In less than a second however, it came back around again, this time two and a half feet off the ground. Still in the air, Umbravon was unable to jump higher, and he did not have time to land. Instead, he simply let his body drop to the ground as the whip flew overhead, desperately rolling to the left as Riva snapped her whip’s blade back onto the ground where he had just been lying. With Umbravon’s body on the ground, Riva swept her blade across the floor again, hoping to catch him along the entire underside of his body as it swept back around Umbravon frantically pushed himself off of the ground with his right hand, his body springing up into the air just as Riva’s whip swept underneath him. Before Riva could bring her whip around again however, Darth Umbravon raced towards her, the red blade of his lightsaber blazing in his hand. Riva snapped the long flexible blade of her lightwhip back towards her body, whipping it around in tighter and faster circular motions than she had used previously in their short duel. Now, only a couple of meters away from each other, Riva was able to lash out at Umbravon with not only the end of her lightwhip, but the entire length of its blade, lashing out at Umbravon erratically from different parts of the blade at irregularly spaced intervals. Umbravon desperately twirled his blade in circular patterns, twisting his arms and body so his blade could meet her whip at the appropriate angle to counter it. After less than five seconds Umbravon staggered back desperately with several glancing cuts along his body. In the short time that he had confronted her so closely, Riva’s lightwhip had carved a light furrow along the side of his left arm, a deep gash across his right thigh, a shallow stab through the left side of his abdomen, and even a glancing cut along his head, just above his right ear. Umbravon called upon his pain and fury to fuel his power, lashing out with a burst of Force power. Riva staggered back half a step as she absorbed his blast with a telekinetic barrier, before dismissively thrusting her own hand forward. A blast of Force energy sent Umbravon sprawling several meters backwards as Riva casually twirled her lightwhip at her side. Umbravon, now desperate for any edge that might prolong his life, reached out with both hands, lifting up a table with the power of the Force. He hurled it towards Riva like a missile with all of his might. Riva took a step back and twirled and cracked her lightwhip in front of her, forming a defensive barrier against the oncoming table. The table was eviscerated and sliced into several shards and splinters, all of which began to circle Riva just as her lightwhip circled her, held in place by her power in the Force. Now back on his feet, Umbravon was able to dash to the side and dodge the first cluster of table shrapnel flung at him, as well as the second, though when he leapt through the air the largest remaining portion of the table struck him square in the chest, hurling him backwards into the bar counter and a few of the still standing barstools. Umbravon quickly leapt back up to his feet, mustering all of the rage and power he could in preparation for what was about to happen next. This time it was Riva who charged forwards, attacking Umbravon with a furious frenzy of slashes and thrusts from her lightwhip as he countered with a combination of tight blocks, powerful thrusts, and broad circular motions. The path of her whip traced a different vector and plane each time it lashed out or swept at him, sometimes bending and twisting mid strike. Umbravon realized she was hoping to close the distance between them and back him up against the bar, so she could carve him to pieces in seconds with her whip. Unwilling to let that happen, Umbravon caught the end of her whip with a circular sweep as it lashed out towards him. Continuing to twirl his blade, Umbravon wrapped it around a decent portion of her whip before flicking his blade to the side, sending its momentum to his right as he dashed to the left. Umbravon raced past Riva as she brought her whip back around, narrowly ducking under a wide sweep, though she managed to score a light slash along his back as he raced away from her. Turning back towards her when he had attained a reasonable distance, Umbravon leaned back suddenly as the blade of her lightwhip shot straight through the area his upper body had been previously occupying. Missing Umbravon, the blade of Riva’s lightwhip stabbed through the overhead light of the cantina, shattering it and sending a shower of sparks and glass shards falling from the ceiling. Umbravon leapt away as Riva took hold of several of the glass shards with the Force and flung them at him, managing to dodge most of them, and protect his face from those that he couldn’t dodge by using his arms, his lightsaber, and a telekinetic barrier of his own. Riva immediately raced back towards him, grunting and screaming furiously as she did so, her whip snapping and cracking towards him even faster than it had previously been moving, driving Umbravon backwards into a desperate retreat. 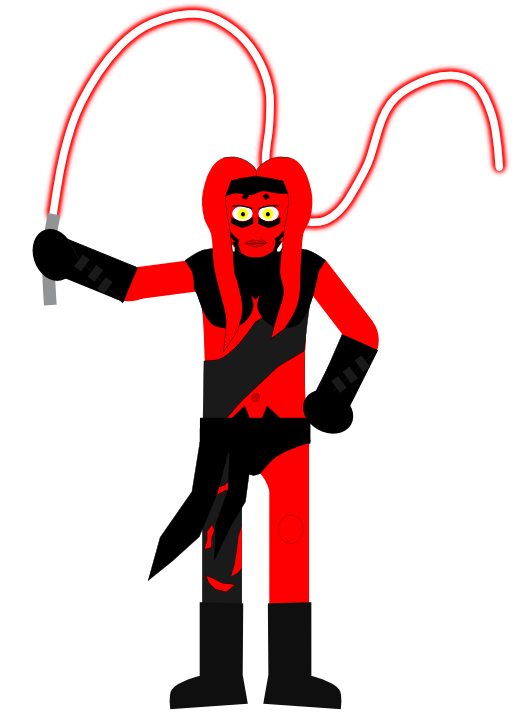 Umbravon knew that the only reason he still had all of his limbs and had no damaged vital organs was because the blade of the lightwhip was weaker than that of a standard lightsaber, though if she got more than a glancing hit on him, he was sure it would cut straight through him, and he wasn’t planning for that to happen anytime soon. Riva swept her whip in a wide arc towards Umbravon, but Umbravon deflected it to the side into the ground, only for Riva to sweep it across the ground in an arc and whip it back upwards once it reached Umbravon. Desperately, Umbravon backflipped through the air just in time before landing on his feet a few meters away. Riva charged at him once more, lashing out several more times with her whip before swinging it behind her and bending over as she sent the blade flying over her head straight at Umbravon’s face. Umbravon managed to slap the whip to the side barely in time before it could skewer his face. Riva simply drew her whip back, and with one forceful snap, sent the whip flying back towards Umbravon. This time, as the whip cracked towards Umbravon, it lashed out at his blade rather than his body, wrapping and twisting itself around his blade. “I’m going to cut you into a thousand pieces YOU WHORE!” Riva screamed as she pulled her blade back towards herself with all of her might. Rather than resist as he was expected to do, Umbravon hurled his lightsaber in the direction she was pulling it with as much velocity as possible, even increasing its speed with a nudge through the Force. The momentum of his lightsaber and her lightwhip flung them both completely behind her body. Then, calling upon as much rage and hatred as he could muster, Umbravon leapt forwards towards Riva, the power of the Dark Side flowing through his body. He covered the distance between them in a fraction of a second before she could bring her whip back in front of her. Then, Umbravon snapped his leg up, slamming the tip of his boot into Riva’s wrist, forcing her to drop her weapon. Then Umbravon hooked his right arm at Riva’s face, but she quickly threw her body back, landing on her back before flipping back up onto her feet once Umbravon’s fist had passed a reasonable distance from where her face had been. Then, she thrust out both arms and unleashed a wave of Force energy upon him. Umbravon felt his body hurtle through the air and slam into the bar counter, shattering the top of it and denting it, almost completely caving it in at the point of impact. “How pathetic!” Riva spat as she called her whip back into her hand, raising it into the air dramatically and triumphantly to strike down her foe. “Now DIE!” she screamed as she started to snap her whip forwards. Time seemed to slow to a crawl for Umbravon as he watched Riva’s whip come up behind her, raised into the air like a cresting wave ready to break upon him. He could feel his anger, his hatred, and his fury, surging through him beneath his flesh. Instinctively, Umbravon drew the power of the Dark Side of the Force into his body, and mapped its power along his passion, twisting and forming latices of it, then strands, then currents, feeling its power radiate from the center of his chest. Umbravon extended both of his arms in front of him, the edge of Riva’s blade now starting to arc towards him. With all of his willpower, Umbravon directed those currents of Dark Side energy into his arms, feeling it surging and coursing within his veins. His hands started to shake and sparks started to form around his fingers as the Dark Side of the Force swelled within his very hands. Riva’s whip was now only a few meters away from flaying him, but now Darth Umbravon knew exactly what to do. When the blade of Riva’s whip was less than a meter away from carving through his skull, Darth Umbravon let out a cry of fury as he thrust both of his arms out in front of him. To the astonishment of everybody else in the cantina, a surge of blue lightning shot out from the very tips of his fingers, the bolts of lightning twisting and wrapping themselves around Riva’s whip as they pushed the blade away from him. Umbravon continued to press, driving her whip further back with more lightning, now channeling the bolts along and through the blade, into the very hilt of the whip itself. The blade of the whip flickered out as Umbravon’s lightning tore through its handle. Now, Darth Umbravon’s attention was focused entirely on Riva. With blue lightning still surging from his hands, Umbravon gestured both of his arms towards Riva, striking her square in the chest with several bolts of electric energy. Riva collapsed to the ground and began to convulse as bolt after bolt of Umbravon’s lightning coursed through her body. Amidst all of his hatred and fury, Umbravon smiled in pleasure as Riva’s form was consumed in a conflagration of blue lightning that had been conjured from the tips of Umbravon’s very fingertips, arcing across the room to strike his helpless foe. As the storm of power within Umbravon died down, he extended a hand and called his lightsaber back to his hands, again enjoying the reassuring snap-hiss of the crimson blade as it ignited before him. He strode over to Riva with slow purposeful steps, keeping her pinned to the ground with the Force. Though Umbravon had stopped electrocuting her a few seconds ago, she continued to twitch and convulse on the ground. Just as Darth Umbravon raised his blade to strike his foe down, a loud voice split the air. “Stop!” a man cried out from the entrance of the cantina. Umbravon turned his head and groaned inwardly. It was one of the Dark Lord’s Guards. Why won’t they just let me kill somebody?! Umbravon asked himself as he deactivated his lightsaber and started to walk away from Riva. She’s probably going to try and kill me again at some point…which is something I wouldn’t have to karking deal with if that blasted guard would just let me kill her right now! “Just call me Patrick,” the Chiss said, interrupting him as he turned to pour a glass of the alcoholic beverage produced by the Killiks. Umbravon grinned in triumph as Patrick slid the glass of golden membrosia towards him. Taking the glass in one hand, Umbravon slammed the drink. The smooth flavor and texture of the membrosia rolled across his tongue and down his throat into his stomach. When the drink was finished, he set the glass back on the table and turned around. Sangara, Ignus, and Nighthawk all walked towards him, each eyeing him with awe. “Dude! Your eyes were glowing yellow there for a few seconds!” Nighthawk exclaimed. And with that, Darth Umbravon glanced one more time at the astonished awestruck faces of everybody in the cantina. Then, he and his friends exited the cantina, and headed off into darkness of the night towards their new living quarters. Darth Umbravon decided then and there that the first thing he would do the next morning would be to practice his new powers.